Warning east of Ciudad del Carmen. state of Veracruz tonight or early Thursday. weakening is expected after landfall in Mexico. eastern Mexico by this evening. 50 KT……. 40NE 0SE 0SW 0NW. 34 KT…….120NE 60SE 0SW 120NW. 12 FT SEAS.. 40NE 0SE 0SW 0NW. 64 KT… 30NE 0SE 0SW 30NW. 50 KT… 60NE 40SE 30SW 60NW. 34 KT…150NE 110SE 70SW 150NW. 34 KT… 30NE 0SE 0SW 30NW. to but remain offshore of the coast of Mexico. increased to near 50 mph (85 km/h) with higher gusts. Dora could become a hurricane on Monday. 251000Z POSITION NEAR 14.8N 101.1W. SYNOPSIS VALID 1200 UTC SUN JUN 25. 24 HOUR FORECAST VALID 1200 UTC MON JUN 26. 48 HOUR FORECAST VALID 1200 UTC TUE JUN 27. CENTER WINDS 20 TO 33 KT. SEAS 8 TO 11 FT.
33 KT. SEAS 8 TO 11 FT. SUSTAINED WINDS 50 KT GUSTS 60 KT. EXTENDED OUTLOOK…USE FOR GUIDANCE ONLY…ERRORS MAY BE LARGE. SUSTAINED WINDS 35 KT GUSTS 45 KT. 118.0W. MAXIMUM SUSTAINED WINDS 20 KT GUSTS 30 KT. TO 8 FT IN N SWELL. .SCATTERED MODERATE ISOLATED STRONG FROM 01N TO 07N E OF 81W. 60 NM OF THE MONSOON TROUGH BETWEEN 126W AND 129W. SOUTH-SOUTHEAST ALONG THE PERIPHERY OF A MID LEVEL SUBTROPICAL HIGH. BE ISSUED AROUND 091400 UTC. 090900Z POSITION NEAR 20.5S 167.5E. COOLER WATERS AND THIS TREND WILL CONTINUE ALONG THE FORECAST TRACK. Severe Tropical Cyclone Donna has now intensified to a category four system with central pressure of 965 heta pascal destructive hurricane force winds estimated at about 90 knots close to the centre. 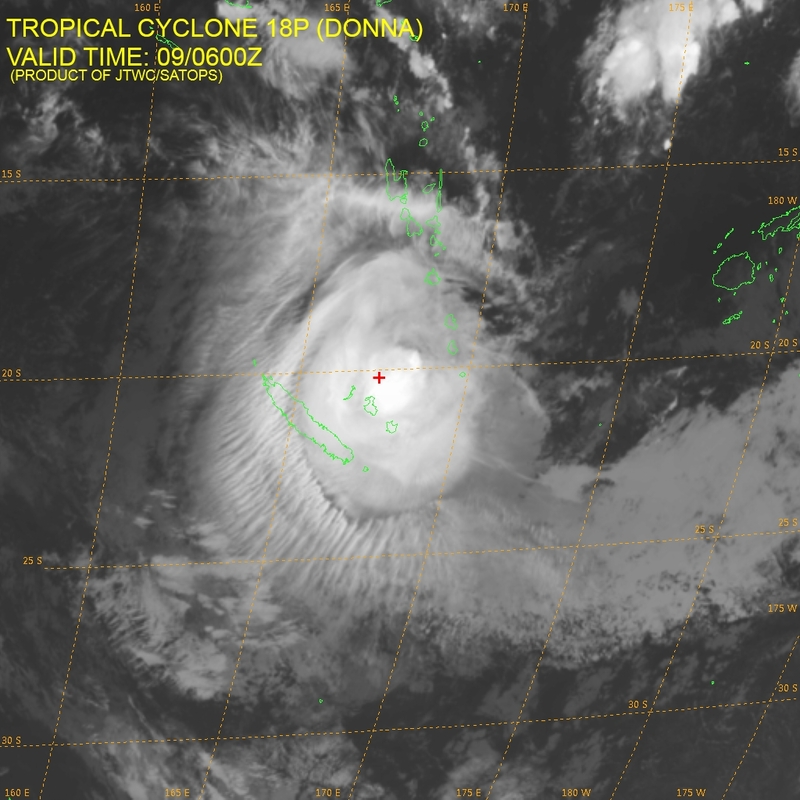 TC Donna was located 700km northwest of Port Vila or 1560km west-northwest of Nadi at mid-day today. Fiji Meteorology Director Ravindra Kumar says it’s moving west-southwest at about 13km/hr and gradually turning southwards and expected to track towards New Caledonia and Southern Vanuatu. He adds that although TC Donna still lies in favourable environment for further intensification, it’s expected to encounter unfavourable environmental conditions as it turns and tracks in a southerly direction. He says Fiji is not directly threatened by TC Donna, however associated strong winds will affect Fiji waters and a strong wind warning remains in force for all Fiji waters. Expect rough seas with east to southeast winds 20 to 25 knots, gusting to 30 knots. Strong wind warning remains in force for all Fiji waters and Occasional showers expected. Isolated heavy rainfall may lead to flash flooding. 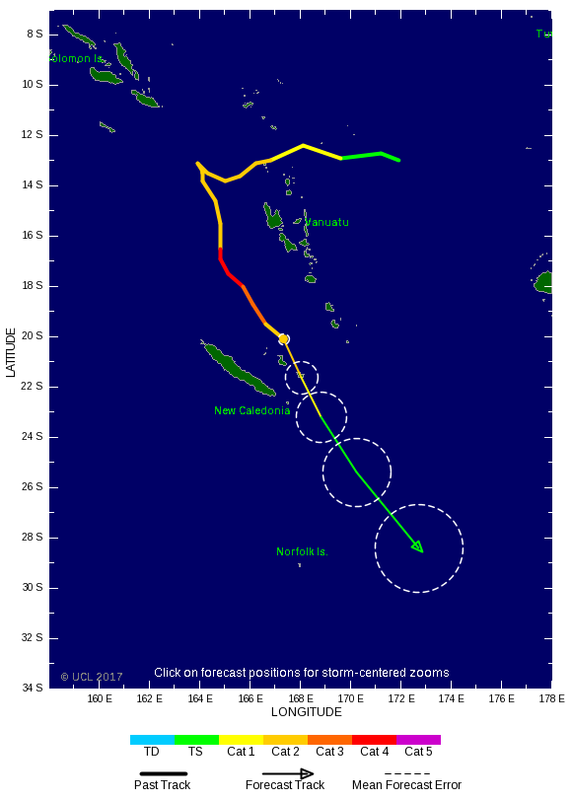 HURRICANE WARNING 032 ISSUED FROM RSMC NADI May 091308 UTC. 168.4 EAST AT 091200 UTC. REPEAT POSITION 21.4S 168.4E AT 091200 UTC. CYCLONE MOVING SOUTHEAST AT 11 KNOTS. EXPECT SUSTAINED WINDS OF 65 KNOTS CLOSE TO THE CENTRE. AND NEAR 24.8S 168.5E AT 101200 UTC. THIS WARNING CANCELS AND REPLACES WARNING 053. THE EXTREME SOUTHWESTERN GULF OF MEXICO LATER TODAY. INCHES…407 MM…IN THE LAST 18 HOURS. NEXT COMPLETE ADVISORY…800 AM PDT. 301000Z POSITION NEAR 18.0N 93.9W. WILL CONTINUE TO WARN ON TROPICAL DEPRESSION 02E (BARBARA). EL EXTREMO SUROESTE DEL GOLFO DE MEXICO TARDE HOY. LOS VIENTOS MAXIMOS SOSTENIDOS HAN DISMINUIDO A CERCA DE 35 MPH … 55 KM / H. ..
LA PRESION CENTRAL MINIMA ESTIMADA ES DE 1000 MB … 29.53 PULGADAS. PULGADAS … 407 MM … EN LAS �LTIMAS 18 HORAS. ADVERTENCIA COMPLETA … 800 AM PDT. POSICI�N 301000Z CERCA 18.0N 93.9W. CONTINUARA ADVERTIR SOBRE LA DEPRESION TROPICAL 02E (BARBARA). 270900Z POSITION NEAR 24.0S 157.7W. The next TC Forecast Track Map is scheduled to be issued within six hours. GALE WARNING 089 ISSUED FROM RSMC NADI Jan 27/0708 UTC 2013 UTC. SOUTH 158.0 WEST AT 270600 UTC. REPEAT POSITION 23.2S 158.0W AT 270600 UTC. CYCLONE MOVING SOUTH-SOUTHEAST AT 10 KNOTS. EXPECT SUSTAINED WINDS OF 35 KNOTS CLOSE TO THE CENTRE. NORTHWEST QUADRANT AND WITHIN 90 NAUTICAL MILES OF CENTRE ELSEWHERE. AND NEAR 27.8S 152.7W AT 280600 UTC. AT MET DOT GOV DOT FJ. REPORTS EVERY THREE HOURS TO RSMC WELLINGTON AS WELL. ISSUED FROM RSMC NADI Jan 27/1011 UTC 2013 UTC. A STRONG WIND WARNING REMAINS IN FORCE FOR SOUTHERN COOKS. MOVING SOUTH-SOUTHEAST AT 09 KNOTS FURTHER AWAY FROM SOUTHERN COOKS. BE ABOUT 30 KNOTS WITH MOMENTARY GUSTS TO 45 KNOTS. THE NEXT ISSUE WILL BE THE ROUTINE BULLETIN AT 271530 UTC. Watches, warnings, and advisories in effect across much of the southern United States. Forecasters project the Pearl River to crest Monday at 19.5 feet, more than five feet above flood stage. That will result in “major flooding” of at least two subdivisions near the banks and threaten areas in the southeastern corner of the parish, according to the National Weather Service. THE TCHEFUNCTE RIVER ABOVE US HIGHWAY 190 NEAR COVINGTON AFFECTING ST.
CAN ALSO BE FOUND AT WEATHER.GOV. THE TCHEFUNCTE RIVER ABOVE US HIGHWAY 190 NEAR COVINGTON. * AT  8:30 AM SUNDAY THE STAGE WAS 25.8 FEET. THE BOGUE CHITTO RIVER NEAR BUSH. * AT 10:15 AM SUNDAY THE STAGE WAS 19.7 FEET. EITHER SIDE OF HIGHWAY 21 IN THE VICINITY OF THE BRIDGE. * AT 10:00 AM SUNDAY THE STAGE WAS 20.9 FEET. IS EXPECTED TO BEGIN SLOWLY FALLING THEREAFTER. * AT 10:00 AM SUNDAY THE STAGE WAS 17.7 FEET. EXPECTED TO BEGIN SLOWLY FALLING THEREAFTER. AT THE 15.5 FOOT STAGE. ST TAMMANY PARISH, LA (WLOX) – Officials in St. Tammany Parish in Louisiana say the danger of a lock failing on a Pearl River Canal has eased. The U.S. Army Corps of Engineers worked overnight to stabilize the lock. A mandatory evacuation is no longer in effect, for those Louisiana residents. However, officials are maintaining a voluntary evacuation status for people in hundreds of homes near Lock Number 2 on the canal. Any potential danger from Lock Number 2 failing would not effect Mississippi, according to the National Weather Service. SUNDAY MORNING UPDATE: The Army Corps of Engineers is at the site on Lock 2. They were able to relieve the pressure by lowering the level of the water upstream to the to the lowest level possible. They are conducting tests to determine the structural integrity now. The evacuation is now voluntary. Eyes in St. Tammany Parish are still honed in on the Pearl River. A mandatory evacuation has been in place for most of the day along the Pearl River Diversion Canal because of an unstable lock holding back the river’s swollen waters due to Hurricane Isaac. It was estimated that if water got around the lock, that it could reach a height of 11 feet. A valve was opened to help relieve pressure and water was starting to get lower, but the Army Corps planned to stay on site and monitor the situation. The mandatory evacuation remained in place as of 10 p.m.
wspa.com UPDATE: August 31, 12:43 a.m.
Isaac is now a Tropical depression centered near southern Arkansas. Winds continue to upwards to 30 miles-per hour. It is expected to move northward through the Mississippi River Valley before moving into the Ohio River Valley by Saturday night. A Tornado Watch is in effect for all of central and southern Mississippi, as well as portions of southeast Louisiana. Tropical Storm Leslie has formed in the Atlantic Ocean and has maximum sustained winds at 50 miles-per hour. It is moving west at 18 miles-per hour. It is projected to move west toward Puerto Rico by Sunday. Hurricane Kirk remains well out in the Atlantic and is not a threat to land. As of 11 p.m., wind gusts were 100 miles per-hour and moving north northwest at 12 miles-per hour. UPDATE: August 30th 2012, 4:40 p.m.
Issac has now been downgraded to a Tropical Depression. TROPICAL DEPRESSION THIS AFTERNOON OR TONIGHT. ALONG THE COASTS OF MISSISSIPPI AND SOUTHEASTERN LOUISIANA. STORM SURGE VALUE OF NEAR 5 FEET CONTINUES AT WAVELAND MISSISSIPPI. NEXT COMPLETE ADVISORY…400 PM CDT. MISSOURI VIERNES POR LA NOCHE. DEPRESIÓN TROPICAL ESTA TARDE O NOCHE. A LO LARGO DE LAS COSTAS DE MISSISSIPPI Y EL SURESTE DE LOUISIANA. OBSERVACIONES 992 MB … 29.29 PULGADAS. COSTA … LA MAREJADA SERÁN ACOMPAÑADOS POR OLAS GRANDES Y PELIGROSAS. VALOR DE LA MAREJADA CERCA DE 5 PIES EN CONTINUA Waveland. ÁREA DE HASTA ESTA TARDE. ADVERTENCIA COMPLETA … 400 PM CDT. Tropical Storm Isaac is forecast to continue strengthening steadily as it moves through the northern Lesser Antilles on Wednesday and into the northeast Caribbean by Thursday. Isaac could become a hurricane as early as Thursday. Residents and visitors of the northern Caribbean, Yucatan Peninsula, southeastern United States and the central/eastern Gulf Coast should watch the progress of Isaac closely over the next week or more. Initial impacts from Isaac will be felt in the northeastern Caribbean islands Wednesday into Thursday. Numerous watches and warnings have been issued, including a hurricane watch for Puerto Rico, the U.S. Virgin Islands and the southern Dominican Republic. Puerto Rico will see its greatest impacts from Isaac on Thursday. Tormenta tropical Isaac se prevé continuar fortaleciendo constantemente mientras se mueve a través de las Antillas menores del Norte el miércoles y en el Caribe noreste para el jueves. Isaac podría convertirse en un huracán tan pronto como el jueves. Los residentes y visitantes de el Caribe Norte, Península de Yucatán, sureste de Estados Unidos y el central y oriental del Golfo deben vigilar el progreso de Isaac estrechamente la próxima semana o más. Impactos iniciales de Isaac se sentirán en las Islas del Caribe noreste el miércoles al jueves. Se han publicado numerosos relojes y advertencias, incluyendo una vigilancia de huracán para Puerto Rico, las Islas Vírgenes y República Dominicana del Sur. Puerto Rico verá sus mayores impactos de Isaac el jueves. Tempête tropicale Isaac prévoit continuer renforcer régulièrement lorsqu’il se déplace à travers les petites Antilles du Nord, le mercredi et dans les Caraïbes du nord-est par jeudi. Isaac pourrait devenir un ouragan dès jeudi. Résidents et visiteurs de la Caraïbe du Nord, péninsule du Yucatan, sud-est des États-Unis et le central/eastern Gulf Coast devraient surveiller les progrès d’Isaac étroitement au cours de la semaine prochaine ou plus. Les impacts initiaux d’Isaac feront sentir dans les îles des Caraïbes du nord-est mercredi à jeudi. Nombreuses veilles et avertissements ont été émis, y compris une veille d’ouragan pour Porto Rico, les îles Vierges américaines et la République dominicaine du Sud. Puerto Rico verra ses répercussions les plus importantes d’Isaac le jeudi. Haití y República Dominicana son apoyados por una agresión como Tormenta Tropical Isaac se acerca a la española, la isla compartida por los dos países. Unos 400.000 haitianos siguen viviendo en campamentos improvisados tras un mortífero terremoto en 2010 son “entre los más vulnerables”, advierten grupos de ayuda. Haïti et la République dominicaine sont contreventés pour un percutant l’approche de la tempête tropicale Isaac Hispaniola, l’île partagée par les deux pays. Quelque 400 000 Haïtiens vivent toujours dans des camps de fortune après un tremblement de terre meurtrier en 2010 sont « parmi les plus vulnérables », avertissent les groupes d’aide. Tropical Storm Isaac se espera que sea un huracán en el momento en que llegue a los Cayos de la Florida en algún momento del domingo, con las condiciones que se deterioran en el sur de Florida durante todo el día domingo. De las 11 am aviso emitido por el Centro Nacional de Huracanes informa vientos de Isaac a 60 millas por hora con su presión a 998 milibares, un ligero aumento de los asesores tres horas antes. El sistema se movía hacia el noroeste a 14 mph. A pesar de que Isaac se debilitó brevemente durante la noche mientras se movía sobre las montañas a lo largo de la punta occidental de la Española, la tormenta tropical se espera que se fortalezca hacia adelante. Pista proyectada de la tormenta se ha desplazado ligeramente hacia el este, y se mantuvo una posible amenaza a Tampa, Florida, donde la Convención Nacional Republicana comienza el lunes. Gobernador de Florida, Rick Scott ha declarado el estado de emergencia como la tormenta tropical Isaac se acerca al estado. Scott dijo que el objetivo era asegurarse de que todas las agencias locales, estatales y federal “tiene la misma información” sobre la tormenta y los preparativos con el fin de tomar decisiones informadas. Emitió el estado de emergencia el sábado durante una rueda de prensa en el condado de Broward. Dr. Rick Knabb, director del Centro Nacional de Huracanes, dijo que la tormenta ha pasado de una manera que podría llevar a Isaac, ya es una tormenta tropical enorme, aumentando en intensidad. “En los últimos días hemos estado hablando de cómo interdependiente de los pronósticos de intensidad de pesca son en este caso relativo cuánto tiempo el centro de Isaac pasa por la tierra en el camino desde el Caribe hasta Florida, dijo el Dr. Rick Knabb, jefe de el Centro Nacional de Huracanes en The Weather Channel. “Desafortunadamente para los EE.UU., tomó el camino de menor resistencia yendo entre Haití y Cuba Todavía hay cierta interacción con el terreno no interrumpir la circulación de alguna manera, pero, en comparación con ayer, estamos más seguros -.. Desafortunadamente para Florida – – que va a tomar un camino que pasa más tiempo en la masa de tierra de Cuba que creíamos posible ayer “. Knabb dijo que espera que las condiciones para comenzar “a ir cuesta abajo” en Florida la madrugada del domingo, y agregó que está “preocupado por el suroeste de Florida, no sólo el sureste, ya que son muy, muy vulnerables a la marejada ciclónica allá abajo, y, a partir de 08 a.m. nuestro asesoramiento, estamos hablando de la posibilidad de que de 5 a 7 pies de inundación de mareas de tempestad en las partes de las zonas costeras del suroeste de Florida. Dicho Knabb:. “La intensidad (de Isaac), incluso si permanece sobre el agua es aún incierto Podemos no es 100 por ciento de garantía de que un huracán va a cruzar los Cayos del sur de Florida, pero las ocasiones son lo suficientemente alto que nosotros” volver a pronosticar que, y hay una advertencia de huracán ahí abajo “. La tempête tropicale Isaac devrait être un ouragan au moment où il atteint parfois les Keys de Floride dimanche, avec des conditions à se détériorer dans le sud de la Floride pendant toute la journée du dimanche. De 11 heures consultatif émis par le Centre national des ouragans rapporte vents d’Isaac à 60 mph avec sa pression de 998 millibars, soit une légère hausse dans les trois heures plus tôt consultatifs. Le système se déplaçait au nord-ouest à 14 mph. Même si Isaac affaibli brièvement durant la nuit pendant qu’il se déplaçait sur les montagnes le long de la pointe ouest de l’Hispaniola, la tempête tropicale devrait se renforcer aller de l’avant. La trajectoire prévue de la tempête s’est déplacée légèrement à l’est, et demeure une menace possible à Tampa, en Floride, où la Convention nationale républicaine commence lundi. Floride gouverneur Rick Scott a déclaré l’état d’urgence alors que la tempête tropicale Isaac se rapproche de l’état. Scott a déclaré que le but était de s’assurer que chaque local, organisme étatique et fédéral »a exactement les mêmes informations” sur la tempête et les préparatifs en vue de prendre des décisions éclairées. Il a émis l’état d’urgence samedi lors d’une conférence de presse à Broward County. Dr. Rick Knabb, directeur du National Hurricane Center, a déclaré la tempête s’est déplacée d’une manière qui pourrait conduire à Isaac, déjà une énorme tempête tropicale, à augmenter en intensité. «Au cours des derniers jours, nous avons parlé de la façon dont interdépendant, les prévisions d’intensité de piste sont dans ce cas par rapport combien de temps le centre d’Isaac passe sur la terre sur le chemin de la Caraïbe en Floride, a déclaré le Dr Rick Knabb, chef de le Centre national des ouragans sur The Weather Channel. “Malheureusement pour les Etats-Unis, il a fallu un chemin de moindre résistance en allant entre Haïti et Cuba Il ya encore une certaine interaction avec le terrain il perturber la circulation un peu Mais, par rapport à hier, nous sommes plus confiants -.. Malheureusement pour la Floride – – que ça va prendre un chemin qui passe plus de temps sur la masse terrestre de Cuba que nous pensions possible hier “. Knabb a dit qu’il s’attend à ce que les conditions pour commencer “à descendre” en Floride dimanche matin, ajoutant qu’il est «préoccupé sud-ouest de la Floride, et pas seulement le sud-est, parce qu’ils sont très, très vulnérable à une onde de tempête là-bas, et, comme d’ 8 heures de notre conseil, nous parlons de la possibilité pour le 5-à-7 pieds d’inondation des ondes de tempête dans les parties des zones côtières du sud-ouest de la Floride. Tropical Storm Isaac is pounding Haiti and the Dominican Republic with torrential rains that are causing extremely dangerous flooding and landslides. Isaac’s center passed over Haiti’s southwest peninsula early this morning, tracking about 50 miles west of the capital of Port-au-Prince. As the center pulled away to the northwest, Isaac’s heaviest thunderstorms moved ashore over Hispaniola near sunrise, and are now dumping heavy rains with rainfall rates approaching one inch per hour, according to recent microwave satellite estimates. Barahona on the south coast of the Dominican Republic had received 5.14″ of rain as of 8 am EDT this morning, and it is probable that some mountainous areas in Haiti and the Dominican Republic have already received up to 10″ of rain from Isaac. These rains will continue though much of the day, and have the potential to cause high loss of life in Hispaniola. Tropical Storm Isaac está golpeando Haití y la República Dominicana con lluvias torrenciales que causan inundaciones y deslizamientos de tierra extremadamente peligroso. Centro de Isaac pasó por la península suroeste de Haití esta mañana, el seguimiento de cerca de 50 millas al oeste de la capital, Port-au-Prince. A medida que el centro se alejó hacia el noroeste, más fuertes tormentas de Isaac se trasladó a tierra a través de la salida del sol cerca de la Española, y ahora el dumping fuertes lluvias con la precipitación pluvial que se acerca una pulgada por hora, de acuerdo a las recientes estimaciones de microondas satelitales. Barahona, en la costa sur de la República Dominicana había recibido 5,14 “de lluvia a partir del 8 am EDT esta mañana, y es probable que algunas áreas montañosas de Haití y la República Dominicana ya han recibido hasta 10” de la lluvia de Isaac. Estas lluvias continuarán aunque gran parte del día, y tienen el potencial de causar grandes pérdidas de vida en La Española. La tempête tropicale Isaac bat Haïti et la République dominicaine avec des pluies torrentielles qui provoquent des inondations et des glissements de terrain extrêmement dangereux. Centre d’Isaac passé sur la péninsule sud-ouest d’Haïti ce matin, à environ 50 miles de suivi à l’ouest de la capitale Port-au-Prince. En tant que centre arrachée au nord-ouest, les plus lourds orages Isaac déplacé à terre sur Hispaniola près lever du soleil, et vident maintenant de fortes pluies avec des taux de précipitations approchant un pouce par heure, selon de récentes estimations satellitaires micro-ondes. Barahona, sur la côte sud de la République dominicaine avait reçu 5.14 “de pluie à partir de 8 h HAE ce matin, et il est probable que certaines régions montagneuses d’Haïti et la République dominicaine ont déjà reçu jusqu’à 10” de pluie Isaac. Ces pluies se poursuivront même si une grande partie de la journée, et ont le potentiel de causer des pertes de vie élevée à Hispaniola. HAVANA — Tropical Storm Isaac pushed over Cuba on Saturday after sweeping across Haiti’s southern peninsula, where it caused flooding and at least four deaths, adding to the misery of a poor nation still trying to recover from the terrible 2010 earthquake. At least four people were reported dead in Haiti including a 10-year-old girl who had a wall fall on her, according to the country’s Civil Protection Office. There were no immediate details on how the others died. The government also reported two injuries; “considerable damage” to agriculture and homes; nearly 8,000 people who were evacuated from their houses or quake shelters; and more than 4,000 who were taken to temporary shelters. Scores of tents in quake settlements collapsed. In a roadside lot in Cite Soleil, the dozens of tents and shelters provided by international groups after the earthquake were tossed to the ground like pieces of crumpled paper, and the occupants tried to save their belongings. Ricknel Charles, a 42-year-old pastor, sheltered some 50 displaced people in his church. “This is the only thing I can do for them: give them a place to sleep,” Charles said. About 300 homes in Cite Soleil lost their roofs or were flooded three feet (one meter) deep, according to Rachel Brumbaugh, operation manager for the U.S. nonprofit group World Vision. The international airport reopened by the afternoon but there was still extensive flooding throughout Port-au-Prince after 24 hours of steady rain. LA HABANA – La tormenta tropical Isaac empujó sobre Cuba el sábado después de barrer a través de la península sur de Haití, donde causó inundaciones y muertes por lo menos cuatro, sumando a la miseria de una nación pobre todavía está tratando de recuperarse de la terrible terremoto de 2010. Centro de Isaac tocó tierra justo antes del mediodía cerca de la punta extremo oriental de Cuba, los árboles y derribando cables de electricidad. En la pintoresca ciudad de Baracoa, la tormenta inundó el malecón costero y un bloque de tierra adentro, destruyendo dos casas. Los meteorólogos dijeron que Isaac representa una amenaza a Florida el lunes y martes, al igual que el Partido Republicano se reúne para su convención nacional en Tampa. Con el tiempo, podría llegar a la península de Florida como un huracán de categoría 2 con vientos de casi 100 mph (160 kph). Gobernador de Florida, Rick Scott, declaró el estado de emergencia, las autoridades instaron a los turistas abandonar los Cayos de la Florida y los EE.UU. Centro Nacional de Huracanes dijo una advertencia de huracán estaba en efecto allí, así como para la costa oeste de Florida desde el sur hasta Bonita Beach Ocean Reef y Florida Bay. Al menos cuatro personas murieron en Haití, entre ellos una niña de 10 años de edad, quien sufrió una caída en la pared, según la Oficina del país de Protección Civil. No hubo detalles inmediatos sobre la forma en que los otros murieron. El Gobierno también informó de dos lesiones; “daños considerables” a la agricultura y los hogares; cerca de 8.000 personas que fueron evacuadas de sus casas o refugios del terremoto, y más de 4.000 que fueron llevados a los refugios temporales. Muchos, sin embargo, se quedó y sufrió. El Grise desbordes del río al norte de Port-au-Prince, el envío de color chocolate se derrame agua a través de la extensa barriada de Cite Soleil, donde mucha gente lo tomó posesiones que pudieron y los llevó sobre sus cabezas, vadeando a través de agua hasta la cintura. Decenas de tiendas de campaña en los asentamientos del terremoto derrumbó. En muchas carreteras en Cité Soleil, las docenas de tiendas de campaña y refugios proporcionados por los grupos internacionales tras el terremoto fueron arrojados al suelo como pedazos de papel arrugado, y sus ocupantes trataron de salvar sus pertenencias. “Nos prometieron que nos iban a construir un hogar estable y nunca llegó”, dijo Jean-Robert Sauviren, un desempleado de 63 años de edad, padre de seis hijos, dijo mientras permanecía de pie descalzo en el agua y en alto sus brazos. “Tal vez no merecemos nada”. Ricknel Charles, un pastor de 42 años de edad, al abrigo de unas 50 personas desplazadas en su iglesia. “Esta es la única cosa que puedo hacer por ellos: darles un lugar para dormir”, dijo Charles. Cerca de 300 viviendas en Cité Soleil quedaron sin techo o se inundaron tres pies (un metro) de profundidad, según Rachel Brumbaugh, gerente de operaciones de la Visión Mundial EE.UU. sin fines de lucro grupo. Médicos Sin Fronteras dijo que prevé un aumento en los casos de cólera debido a las inundaciones y se prepara para recibir a más pacientes. El aeropuerto internacional volvió a abrir por la tarde, pero aún había grandes inundaciones en todo Port-au-Prince, después de 24 horas de lluvia continua. LA HAVANE – La tempête tropicale Isaac poussé sur Cuba le samedi après déferle sur la péninsule sud d’Haïti, où il a causé des inondations et au moins quatre morts, en ajoutant à la misère d’un pays pauvre encore en train de se remettre de la terrible tremblement de terre de 2010. Centre Isaac a touché terre juste avant midi près de la pointe extrême-orientale de Cuba, les arbres et les lignes électriques Downing. Dans la pittoresque ville de Baracoa, l’onde de tempête a inondé le Malecon et un bloc intérieur des terres, détruisant deux maisons. Les prévisionnistes dit Isaac constitue une menace pour la Floride lundi et mardi, tout comme le Parti républicain se réunit pour sa convention nationale à Tampa. Il pourrait éventuellement frapper la péninsule de la Floride comme un ouragan de catégorie 2 avec des vents de près de 100 mph (160 kmh). Floride gouverneur Rick Scott a déclaré l’état d’urgence, les responsables demandé aux vacanciers de quitter les Keys de Floride et le US National Hurricane Center dit un avertissement d’ouragan est en vigueur là-bas, ainsi que pour la côte ouest de la Floride du sud pour Bonita Beach Ocean Reef et pour la baie de Floride. Au moins quatre personnes ont été déclarées mortes en Haïti, y compris une fillette de 10 ans qui a fait une chute sur son mur, selon le Bureau du pays de la protection civile. Il n’y avait pas de détails sur la façon immédiats les autres sont morts. Le gouvernement a également fait état de deux blessés; “des dégâts considérables” pour l’agriculture et les maisons; près de 8.000 personnes qui ont été évacuées de leurs maisons ou des abris du tremblement de terre, et plus de 4.000 qui ont été prises pour des abris temporaires. Beaucoup, cependant, sont restés et ont souffert. La rivière Grise débordé au nord de Port-au-Prince, l’envoi de brun chocolat humidifier le bidonville tentaculaire à travers de Cité Soleil, où beaucoup de gens saisi ce qu’ils pouvaient biens et les emportèrent sur leurs têtes, pataugeant dans l’eau jusqu’à la taille. Des dizaines de tentes dans les campements du tremblement de terre s’est effondrée. Dans beaucoup en bordure de route à Cité Soleil, des dizaines de tentes et des abris fournis par des groupes internationaux, après le tremblement de terre ont été jetés sur le sol comme des morceaux de papier froissé, et les occupants ont essayé de sauver leurs biens. Ricknel Charles, un pasteur de 42 ans, à l’abri quelque 50 personnes déplacées dans son église. «C’est la seule chose que je peux faire pour eux: leur donner un endroit pour dormir», dit Charles. Environ 300 maisons à Cité Soleil ont perdu leurs toits ont été inondées ou trois pieds (un mètre) de profondeur, selon Rachel Brumbaugh, directrice des opérations pour la vision américaine à but non lucratif du monde groupe. Médecins Sans Frontières a déclaré qu’il s’attend à un pic de cas de choléra dus aux inondations et il se préparait à recevoir plus de patients. La réouverture de l’aéroport international de l’après-midi, mais il y avait encore d’importantes inondations à travers Port-au-Prince après 24 heures de pluie continue. BATON ROUGE — Tangipahoa Parish officials have issued a mandatory evacuation for communities near the Tangipahoa River because Percy Quin Dam in Mississippi is expected to fail, officials said Thursday. The dam in Pike County is in imminent danger of failure due to flooding from Hurricane Isaac, officials said. U.S. Rep. Steve Scalise announced that parish President Gordon Burgess called for immediate, mandatory evacuation on his Facebook page, saying the dam on Lake Tangipahoa is in “extreme danger” of failing. The evacuation area runs from Kentwood to Robert along the river, he said. NO HAY NINGÚN EFECTO DE EN RELOJES O ADVERTENCIAS COSTERA. CICLÓN EN UN DÍA O DOS. RÁFAGAS EN LAS DUCHAS DE PASO. ESTIMADO MÍNIMO DE PRESIÓN CENTRAL ES DE 1005 MB…29.68 PULGADAS. PRODUCIR MORTALES INUNDACIONES REPENTINAS Y DESLIZAMIENTOS DE TIERRA. REMNANTS OF ERNESTO WILL CONTINUE DURING THE NEXT DAY OR TWO. NEW NAME IF IT BECOMES A TROPICAL STORM. RESTOS DE ERNESTO CONTINUARÁ DURANTE EL SIGUIENTE DÍA O DOS. NUEVO NOMBRE SI SE CONVIERTE EN UNA TORMENTA TROPICAL. NHC_DrRickKnabb: Ham radio operators indicate storm surge flooding more than 2 ft on Ambergris Care Island, Belize. NHC_DrRickKnabb: Operadores de radio de jamón indican marejada inundaciones de más de 2 pies en la isla de Ambergris cuidado, Belize. The National Coordinator for disaster reduction (Conred) explained in a statement that the rains affected 155 people in El Rastro and Ixobel neighborhoods and in the colonies the miracle and Santa Fe, in the municipality of Poptún, in the Northern Department of Petén. WITHIN THE WATCH AREA…IN THIS CASE WITHIN THE NEXT 24 TO 36 HOURS. AIRCRAFT IS 962 MB…28.41 INCHES. NEXT INTERMEDIATE ADVISORY…500 PM PDT. NEXT COMPLETE ADVISORY…800 PM PDT. VER DESDE CABO CORRIENTES HACIA EL NORTE HASTA SAN BLAS. DENTRO DEL AREA BAJO VIGILANCIA … EN ESTE CASO DENTRO DE LAS PROXIMAS 24 A 36 HORAS. POSIBLES EN EL AREA BAJO VIGILANCIA … GENERALMENTE DENTRO DE 48 HORAS. PRODUCTOS EMITIDOS POR EL SERVICIO METEOROLOGICO DE MEXICO. LLEGAR A LA COSTA DE MEXICO COMO UN HURACAN. AVION ES 962 MB … 28.41 PULGADAS. POSIBLES EN EL AREA BAJO VIGILANCIA viernes por la noche. PUEDEN PRODUCIR INUNDACIONES REPENTINAS Y DESLIZAMIENTOS. Acompañados por las olas de gran magnitud. PUEDE CAUSAR LA VIDA O MUERTE Y SURF RIP condiciones actuales. PROXIMA ADVERTENCIA INTERMEDIA … 500 AM PDT. ADVERTENCIA COMPLETA … 800 PDT PM.